The last two days have been full on. We all try to use these quiet days to install our measuring stations on the sea floor and in the intertidal zone. Not having high waves is making life less complicated. We have mounted 6 stations with ADCP's (horizontal and vertical) in the subtidal zone so far. Tomorrow they will try to complete the intertidal zone. At the water line the Utrecht team has installed some of their pressure sensors in the same cross shore arrays. 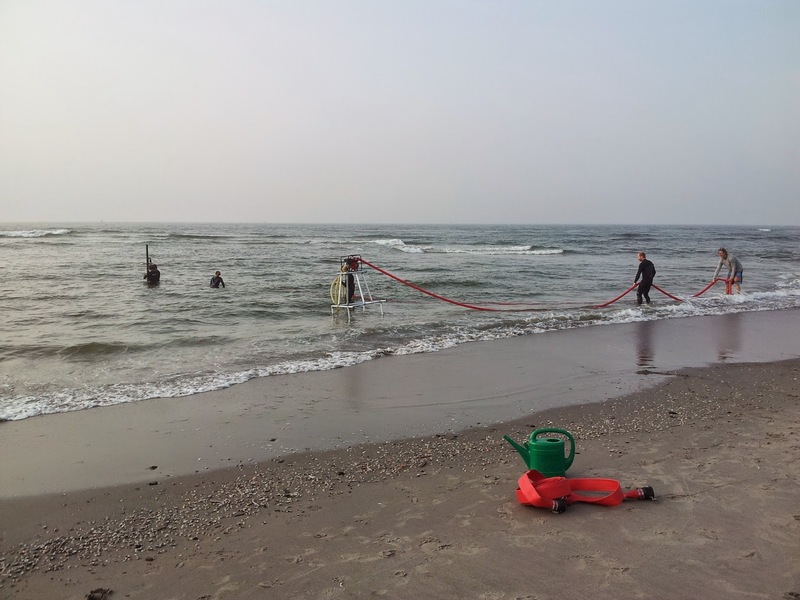 The TUDelft team in action jetting the pipes with the jetpump in small waves. The Utrecht team has also set up a large array of pressure sensors in one particular cross shore array. In this array there is a more elaborated frame with instrument for more detailed flow measurements and a bottom scanner. The 'spider' like rig of the Utrecht team in the intertidal zone. Most surfzone instruments are in! The beach maintained by worms?